MISSOULA – Renowned wildfire scientist Jack Cohen wants Missoula area residents to know wildfires don’t usually burn homes in communities; poor wildfire preparation does. “Wildfires and extreme wildfire conditions are inevitable. But maybe we have opportunities to keep homes from burning down without necessarily having to suppress a wildfire. Maybe we can actually separate the problem of homes burning from that of extreme wildfire conditions,” Cohen told about 40 Bonner homeowners at the Kettlehouse Taproom Wednesday evening. Cohen’s talk, “Wildland-Urban fire destruction and opportunities for preventing disaster,” was the first of four wildfire-preparation talks in the Missoula area sponsored by Missoula County, the Montana Department of Natural Resources and Conservation and Montana’s Elders for a Livable Tomorrow. Cohen argued that homeowners who live in forested regions like that around Missoula, or even grasslands, must take responsibility and prepare their property to survive wildfire rather than relying on firefighters to save their homes. Because, during intense fire conditions, firefighters will likely be overwhelmed. “When fire chiefs ask me, ‘What can we say to get people engaged?’ I say, ‘Tell them we can’t be effective without you,’ ” Cohen said. Cohen, retired Forest Service Fire Lab researcher, has studied dozens of communities that burned in wildfires, from the 1993 Laguna Beach Fire that burned more than 400 homes in California to the 2018 Camp Fire that burned almost 19,000 structures around Paradise, Calif. In the aftermath, he’s found a recurring pattern in almost every incident. Often, houses will be burnt to the ground, but nearby trees are still green and wooden fences still stand, indicating the wildfire didn’t burn through the area. And occasionally, one house will remain untouched amid the devastation, such as the “Miracle House” in the Laguna Fire. So what’s the difference? Cohen’s answer is the houses themselves and how the owners cared for the property. Wildfire will often burn to the edges of communities and then drop low where there are fewer trees to burn. Cohen did experiments to show that houses rarely catch fire due to being near the heat of a wildfire. As long as a wildfire doesn’t come within 100 feet of wooden structures – that’s a conservative distance now called the “home ignition zone” – no charring occurs. After a wildfire has passed, Cohen said, some homes will start burning a few hours later because firebrands have finally ignited something flammable, like an unmodified wooden deck or organic debris in gutters or roof corners. Firebrands are pieces of burning wood that wildfires can throw off, sometimes as far as a half-mile if winds are strong. When enough firebrands ignite the wood or debris on or around a house, the house can catch fire without the wildfire itself coming near. But it’s not only wildfires that throw firebrands – burning houses can, too. So a house can catch fire due to the burning of a neighbor’s house. When extreme conditions send hundreds or thousands of firebrands into a community, houses begin to burn and cause other houses to catch fire. Firefighters have no hope of stopping the cascade of fires so they retreat for safety. Even slower moving ground fires can cause damage, if homeowners haven’t cleared grass or debris away from the base of their homes, allowing flames to contact the house. So that’s Cohen’s pattern: Severe fire conditions – drought, high temperatures and wind – promote wildfires. Intense wildfires throw firebrands that cause urban fires that escalate to overwhelm firefighters. With no house-fire suppression, disaster results. Wildland firefighters can’t do much to stop the small percentage of wildfires that escape early suppression to burn millions of acres, especially in fire-evolved forests like lodgepole pine. So the first two steps of Cohen’s pattern will continue to exist. Even forests that have been thinned don’t do much to stop more intense wildfires; crown fires might drop to the ground, but they still move through and firebrands still fly. So the answer isn’t necessarily cutting down more trees, especially as new development inflates the wildland-urban interface. “There is a side benefit to appropriate fire management, but it won’t keep highly vulnerable houses from burning down. 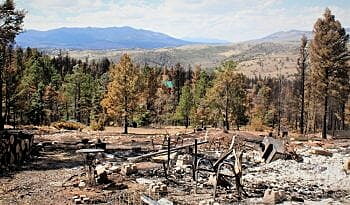 The reason I got involved in houses was so that we could begin to have a more ecologically appropriate management approach to fire occurrence in our wildlands,” Cohen said. Homeowners can do a lot to prevent their homes from burning and thus avoid the disaster of suburban conflagration. And it doesn’t require huge, expensive steps like replacing your roof with metal, Cohen said. That’s probably a good investment of time, because audience members brought up the fact that insurance companies are beginning to put limits on homeowners policies in wildfire-prone areas. Cohen said the companies didn’t worry about fire claims in the past because they didn’t used to have many. But that’s changing fast. One insurance company in Paradise folded a few months ago because it couldn’t pay all the claims. On Wednesday afternoon, Missoula city and county leaders threw their support behind the Wildfire Adapted Missoula partnerships when they signed a proclamation stating their support for making Missoula more fire-adapted and for increasing the resiliency of public lands around Missoula. 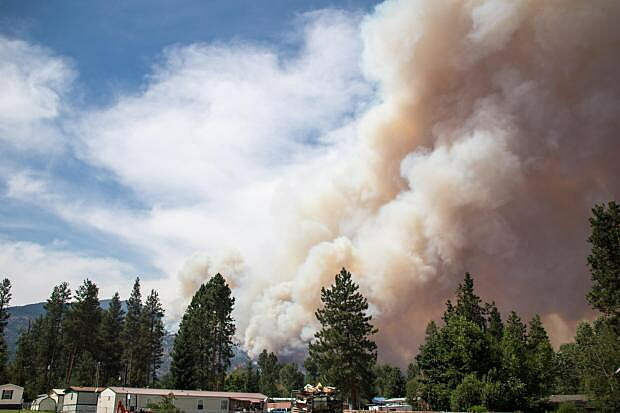 “A year ago, when we adopted our updated community wildfire protection plan, we made a commitment that it not be another document that just sits on the shelf and gathers dust, but that it be something that is implemented. Everything that we talked about today (as far as) next steps leads us in that direction,” said Missoula County Commissioner Dave Strohmeier. During last week’s meeting, Forest Service employees explained the National Cohesive Wildland Fire Management Strategy, which seeks to make communities more fire-resistant and emphasizes multi-agency partnerships to manage lands before and during wildfire events. Dr. Colin Hardy, retired Forest Service Fire Lab researcher, did a shout-out to Cohen when he emphasized that homes need to be more ignition-resistant and that the public shouldn’t depend exclusively on wildfire suppression. He also argued for the need for more prescribed burns around communities to eliminate fuels, even though it means more smoke in the air. To hear Cohen’s information, attend one of the other two remaining talks: 6:30 p.m., April 17, at the Grant Creek Best Western Inn; and 7 p.m., April 24, at the Target Range School.